Judith Redmond of Full Belly Farms reflected: “We used to be a nation of farmers, but now it’s less than 2 percent of the population in the United States. So, a lot of us don’t know a lot about what it takes to grow food.” Being a city girl – and one in serious need of a green thumb at that – I would agree with Ms. Redmond’s assessment. 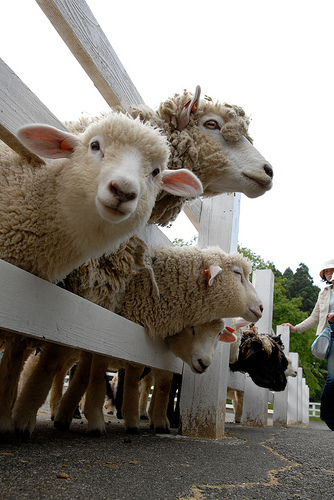 However, there is good news for the agriculturally-uneducated: a wealth of living history farms and museums that explore the world of agricultural and rural life. One of the most significant events in the history of farm and rural life museums occurred in 1926 with the opening of Colonial Williamsburg. Created by John D. Rockefeller, Jr., Colonial Williamsburg was a new form of museum in which the buildings were the items on display, in which history came alive through a place you could touch, a time you could journey to, people you could speak to, and events you could participate in. Williamsburg was followed by Henry Ford’s attempt to bring America’s rural and agricultural past to life: the Henry Ford Museum and Greenfield Village. Located in Dearborn, Michigan, Greenfield Village was the largest history museum of the age when it opened in 1929. Ford approached his museum a little differently than Rockefeller. While Rockefeller had restored a historical site, Ford imported historical items from various states to create his own village. No matter their methods, Ford and Rockefeller had started a trend in the museum world that would lead to the creation and restoration of farm and living history museums around the world. They had something else in common, though: a somewhat idealized picture of what American life was like in colonial times or on the farm. One of the commonly issued criticisms about living history museums – about museums in general, one could argue – is that a part of the story is always left out. Museums, charged with the dual task of welcoming newcomers and the continued education of veteran visitors, sometimes have to toe that middle line. Seeing as though a very limited percentage of the American population has had exposure to farms, food production, and rural life, it seems appropriate to me that these museums err on the side of introductory information. If that doesn’t satisfy your curiosity, go ahead and ask the tough questions of the museum’s history interpreters: you might be surprised what you’ll learn. So, if you are part of that 98% of the American non-farming population, why not take advantage of the fact that it’s Harvest Time and go see what is going on down on the farm. 1) Why is it called Pickpocket Almanack? The title means, roughly, “stolen calendar.” It’s because the program borrows and compiles event calendars from all the venues in the Bay Area to make a sort of meta-calendar—which is subsequently used by the faculty to create courses. The word “pickpocket” was actually suggested by artist Anne Walsh as a more provocative way of naming an experimental school. I think her suggestion was “Pickpocket Academy,” which I liked, but ultimately I decided not to use the terms University, Academy, School etc after talking with artist Brian Conley. I told him I wanted to try to break the teacher-student hierarchy, or at least disrupt the conditioned roles inherent in formal education. He suggested one way to send this signal was to use different language. I took his advice. 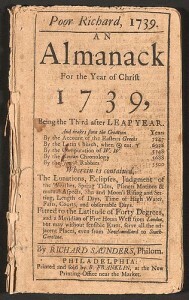 When I was was first thinking about the word “Almanac” I was looking at Benjamin Franklin’s Poor Richard’s Almanack, which was his most populist publication. The extra “k” is in homage to him. As is some of the typography of the website, designed by the brilliant Scott Ponik. 2) Can you tell me a little bit more about Pickpocket Almanack? What was the inspiration for the program? For the last couple of years I’ve been compiling research into artist initiated schools. This includes Amy Franceschini’s Playshop, Tsuyoshi Ozawa’s University of Sodan Art, The Center for Urban Pedagogy, Jon Rubin’s Independent School of Art, Ted Purves’ Momentary Academy, The Mountain School (not to be confused with Black Mountain College), Fritz Haeg’s Sundown Schoolhouse, and Pablo Helguera’s School of PanAmerican Unrest. All of these excellent and extremely varied approaches to education serve as markers of a changing artworld, and informed my thinking about the Pickpocket Almanack. 3) What is the most interesting event you have featured in this season of Pickpocket Almanack? What sort of events pique your interest or what criteria is used to select events for the school? The way Pickpocket is set-up, I’ve collected a master calendar of about 100 events, including lectures, panel discussions, workshops, screening etc. I subsequently presented these to the five faculty member’s we’ve asked to organize courses. These cultural experts living in the SF Bay Area will undoubtedly each have a uniquely different selection process and criteria, and I won’t attempt to speak for them. However, I can say that the program is less about picking favorites and more about constructing an alternative narrative. Of course I expect that they’ll pick events that are worth going to, but as the selection is happening this week, I’m not yet sure how things will turn out. I’m as excited and curious as any of the hundred or so people who have already expressed interest in singing-up. Ultimately, I think the most interesting event will be the final group meetings with the faculty at the end of each course. (Thanks go to legendary Bay Area curator and my friend Renny Pritikin for suggesting this aspect of the program). 4) Why did you choose to operate Pickpocket Almanack through a museum? Would it be successful/unsuccessful if it was not conducted through any organization? I first started discussing the rough ideas for Pickpocket Almanack with Dominic Willsdon who was working on some plans that involved connecting various institutions in the Bay Area. It was a proposal germane to an ongoing conversation and was developed within that context. Dominic is the Curator of Education and Public Programs at SFMOMA, and he has been a huge help in pushing the program as far as it could go. I couldn’t have done it without him. 5) Do you hope that people go through the program and to events alone or do you see this as a more communal learning experience? That is one of the big questions, and we’ll have no way of knowing how it’s going to work for individuals until the courses start. Everyone signed-up for a particular course will be connected via email groups, but wether they’ll decide to become “communal,” to use your word, is still one of the great unknowns. We’ll do a few things to help make this possible, to break the ice, but that’s as far as we’ll go. The rest will be up to them. It’s also interesting to note that while the five key events that make up the course will be made public via the website (for anyone to “audit”), there will be other events and readings available only to the participants who’ve signed-up, sent out via email by the faculty. 6) Since this is an “experimental school,” are you aiming to create a new way of learning, or are you hoping to enhance people’s experience with Bay Area culture, both, or something else altogether? Essentially, what is your goal with this program? I’ll answer this in a personal way. I tend to go to events (lectures, screenings, symposia etc.) either when I already know of the artist or writer or filmmaker or at the recommendations of friends and colleagues. If no one points out a particular person or event to me, I rarely go. And while I have some affinities for certain institutions in the Bay Area, and do occasionally read the papers and websites, the rarity of recommendations means I get stuck in routines and don’t typically go to things I know nothing about. I suspect this is true of most people interested in culture living in big cities. That they’re willing but don’t tend to go to unfamiliar events without some nod or pointer. PIckpocket is, at its most basic, a structure for guiding these decisions, through taking the advice of those respected in the field. In compiling the master calendar for this Fall, it became obvious like never before just how much I’ve been missing. 7) Do you see Pickpocket Almanack, or some variation of it, taking root in other museums? Or do you feel that there is something distinctly Bay Area about the program? I do think the idea is portable, but I think it’s best suited for cities that have too many interesting things happening. It’s a good problem to have, and Pickpocket is just one way to address it. To develop the master calendar we’ve partnered with Happenstand.com, the best listing of art related events, places and people in the SF Bay Area, hands down. Websites like Happenstand are invaluable resources for tracking the pluralistic landscape of contemporary art. Enrollment for the Fall Season of Pickpocket Almanack (October 1 – December 11) begins September 23.